Just beyond the eight-mile mark, Chicago Marathon runners were greeted by dance music, flag-twirling and choreographed cheerleading. At the center of the festivities was the Chicago Spirit Brigade, a volunteer organization that raises money performing at public Chicago events. For the Chicago Marathon, the roughly thirty Brigade members were set up at the intersection of Belmont and Broadway--directly next to volunteers passing out cups of water and Gatorade. 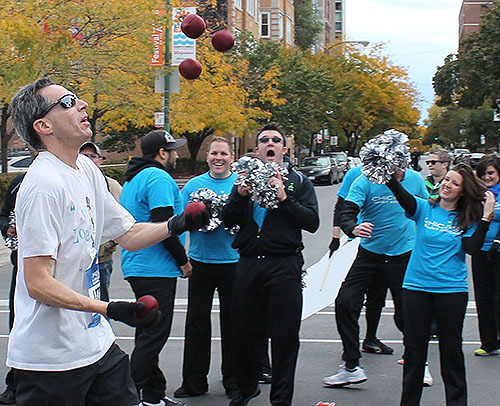 To support the runners and raise awareness for their organization, the Brigade performed organized cheers with silver pom-poms, had two flag-twirlers and chanted “R-U, N-N, E-R-S, Run, Run Run!” in their matching light blue ‘Chicago Spirit Brigade’ shirts. To be a part of the Brigade, members pay dues for $300 and practice their routines every Sunday from 1-5. The member dues allow the group to add 25 percent from their own funds to any donation made over $10. Volunteers step up: Despite rumors on Twitter Saturday night that there a shortage of volunteers at Sunday’s marathon, there turned out to be plenty, at least, near Lincoln Park Zoo. “We have more than enough volunteers,” said Bob Hudnall, a coordinator at the five-mile mark. From teenagers to senior citizens, teams of helpers were busy handing out stacks of cups of water and energy drinks to the thousands of runners that went by. According to Hudnall, the key personnel got to the site at 4 a.m. that morning, and others were asked to be there to set up and pour the drinks between 5 a.m. and 6:30 a.m.
A few dedicated volunteers had the esteemed title of “side announcer,” which consisted of standing on a platform and screaming phrases such as, “Gatorade is followed by the water,” and “Welcome to mile five,” on repeat endlessly.” At the 53 minute mark, their voices were already noticeably strained. Outdoor bathrooms: Despite having 1,500 Port-a-Potties provided at various points along the route for Sunday’s race, many men still felt the need to take advantage of their God-given ability to urinate standing up. 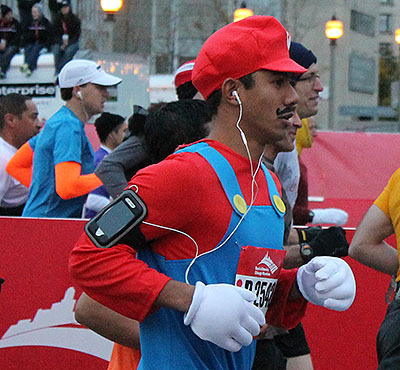 Marathon playlist review: The sound of cliché music was something present all the way from start to finish at the marathon. The song “Born to Run” by Bruce Springsteen was blasted through speakers as the runners were first let through the starting gate. And if that wasn’t cheesy enough, near the end of the race, at the corner of Cermak Road and Wentworth in Chinatown, Lady Gaga’s “Edge of Glory” (get it?) was playing. And as if the runners didn’t already know that they were inspiring people, the “Rocky” theme was played with just about a mile left in the race. The other problem was that many of the music stations only had a playlist that was three songs long. While the runners wouldn’t notice, the spectators heard the same tunes over and over. Notes: According to the Chicago Tribune, marathon organizers came up 1,300 finisher medals short and will have to mail them to those who completed the race but did not receive one. A record 38,535 people started the race this year. ... Volunteers near Belmont Ave and Broadway ran out of water by 10 a.m., 30 minutes before all runners had passed. Gatorade was still available at the location. The northbound Red Line was delayed from 8 a.m. to 8:20 a.m., forcing spectators to change their viewing points of the race. ... As usual, there was a pretty large turnout of spectators along the sidelines of the running route. 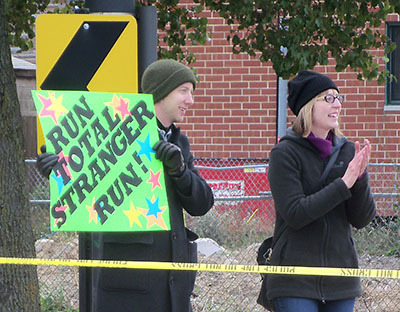 People braved the chilly autumn air and cheered on participants with cowbells, whistles, inflatable thundersticks, banners and various signs, including one that read “Run total stranger, Run!” Other creative signs on the route: "The Kenyans Went THAT way!" and "Chuck Norris Never Ran a Marathon!" What happens to the runners' clothing that they take off and toss along the marathon route? It's bagged, then runners are allowed to sift through it after the race to find their belongings. Unclaimed items are donated to charity. Pacific Garden Rescue Mission is this year's recipient.